GRABOVO, Ukraine -- A Malaysia Airlines passenger plane carrying 298 people was shot down over eastern Ukraine on Thursday, Ukrainian officials said, and both the government and the pro-Russia separatists fighting in the region denied any responsibility for downing the aircraft. An earlier tally of 295 dead was raised to include three infants in an official list of passengers released by Malaysia Airlines. The bulk of the passengers were from the Netherlands -- 154 people. Next highest was 43 from Malaysia and 27 from Australia. It was not immediately known whether any Americans were on board. U.S. military intelligence strongly suspects a surface-to-air missile brought down Malaysia Airlines Flight 17 as it flew at 33,000 feet over the war zone in eastern Ukraine, CBS News has learned. Wreckage and bodies were spread over several miles along the flight path, CBS News correspondent Bob Orr reported. That would be consistent with the plane being ripped apart by aerodynamic forces after the aircraft was penetrated by a high explosive projectile. As plumes of black smoke rose up near a rebel-held village of Grabovo, an Associated Press journalist counted at least 22 bodies at the wreckage site 25 miles from the Russian border. Russian President Vladimir Putin said Kiev "bears responsibility" for the crash because the plane was brought down in Ukraine. "This tragedy would not have happened, if there had been peace on that land, or in any case if military operations in southeastern Ukraine had not been renewed," Putin said in televised comments, according to Reuters. It was not clear who would take part in the investigation. But, Ukraine likely needs to bring in some high-powered expertise, perhaps from the U.S. or Britain, Orr said. The U.N. Security Council planned to hold an emergency meeting on Friday morning, hoping to receive unanimous approval for a statement calling for an independent, international investigation of the incident, CBS News' Pamela Falk reported. The White House in a statement released late Thursday called for a "full, credible, and unimpeded international investigation" as soon as possible. The Boeing 777-200ER plane, traveling from Amsterdam to Kuala Lumpur, appeared to have broken up before impact and the burning wreckage - which included body parts and the belongings of passengers - was scattered over a wide area. There were no survivors. Malaysia's prime minister said the plane didn't make any distress call before it went down, and that the flight route had been declared safe by the International Civil Aviation Organization. The government of Ukraine said in a statement Thursday afternoon that it has evidence that the Russian military was involved in the crash. Ukraine's security services produced what they said were two intercepted telephone conversations that they said showed rebels were responsible. In the first call, the security services said, rebel commander Igor Bezler tells a Russian military intelligence officer that rebel forces shot down a plane. In the second, two rebel fighters - one of them at the scene of the crash - say the rocket attack was carried out by a unit of insurgents about 15 miles north of the crash site. Neither recording could be independently verified. Rebel leader Igor Girkin (also known as Igor Strelkov) apparently deleted a statement online saying his "militia" had just downed an aircraft, thinking it was an Antonov AN-26 military plane. CBS News obtained a cached version of the post, in which he said Ukraine was warned not to "fly in our skies." Vice President Joe Biden said it appeared that the plane's downing was not an accident and that the passenger jet apparently was "blown out of the sky." Earlier, CBS News national security correspondent David Martin reported that if a missile took down the plane, it would have to be a Russian-made surface-to-air missile system, complete with radar, fire control, launcher and missile. A shoulder-fired missile could not have reached that altitude. 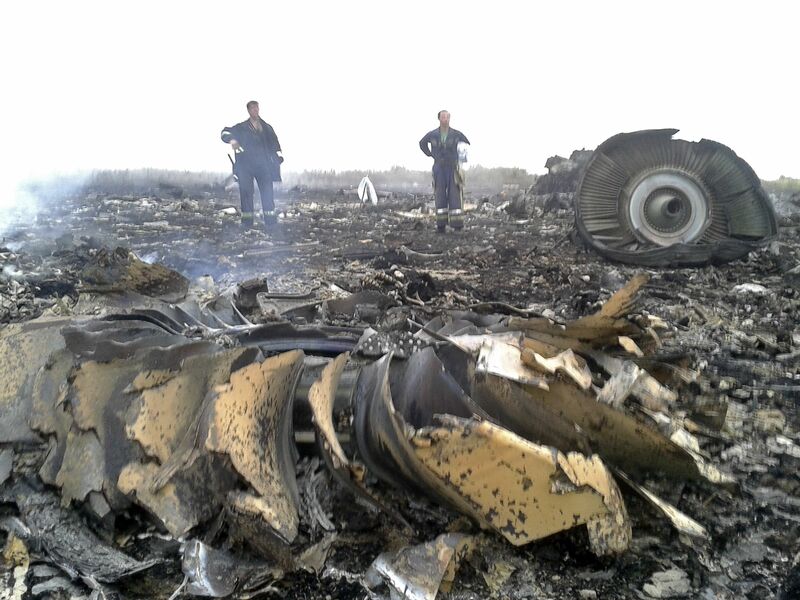 Which missile system shot down Malaysian Airlines Flight 17? One active theory, Martin reported, is that the surface-to-air missiles were targeting a Ukrainian military aircraft that was operating very close to MH17 and that the missiles missed their intended target and locked onto the civilian aircraft. On two occasions earlier in the week, Martin reported, U.S. intelligence determined that surface-to-air missiles had shot down a Ukrainian cargo plane and a Ukrainian Frogfoot jet fighter. Both of them were flying above 20,000 feet, which is above the range of shoulder-fired missiles. CBS News correspondent Margaret Brennan reported that surface-to-air missiles are at the very top of the list of weapons that the U.S has been trying to get Russia to stop providing to the pro-Russian separatists in Ukraine. Those weapons-makers were among those targeted in the most recent round of sanctions levied Wednesday. President Barack Obama called the crash a "terrible tragedy" and talked about it on the phone with Russia's Putin. CBS News White House correspondent Major Garrett reported that the flight manifest did not come with passport numbers or country of origin for the passengers, complicating the U.S. government's process of identifying or determining whether Americans were on board. At least 154 people on the flight were Dutch citizens, said Huib Gorter, Malaysian Airlines senior vice president in Europe. There were also 27 Australians on board, 43 Malaysians, including all 15 crew, and 12 Indonesians. Other nationalities so far identified were nine passengers from the United Kingdom, four from Germany, four Belgians, three from the Philippines and one Canadian. There are still 41 dead whose nationalities haven't yet been confirmed, he added. The village of Grabovo is currently under the control of pro-Russia separatists and the area has seen severe fighting between the two sides in recent days. Aviation authorities in several countries had issued warnings not to fly over parts of Ukraine prior to Thursday's crash. Within hours, the Federal Aviation Administration said it was directing all U.S. airlines to avoid flying over eastern Ukraine. Several airlines, including Lufthansa and KLM, released statements saying they were avoiding parts of Ukrainian airspace. Eurocontrol, an agency that coordinates European airspace, said the Malaysian jetliner was flying at 33,000 feet -- 1,000 feet above a closed section of airspace. "According to our information, the aircraft was flying at Flight Level 330 (approximately 10,000 meters) when it disappeared from the radar," Eurocontrol said, according to Reuters. It said the plane was carrying 283 passengers and 15 crew members. It had left Amsterdam at 12:15 p.m. and was due to arrive at Kuala Lumpur International Airport at 6:10 a.m. Friday. Anton Gerashenko, an adviser to Ukraine's interior minister, said on his Facebook page the plane was flying at an altitude of 33,000 feet when it was hit by a missile from a Buk launcher, which can fire up to an altitude of 72,000 feet. Igor Sutyagin, a research fellow in Russian studies at the Royal United Services Institute, said both Ukrainian and Russian forces have SA-17 missile systems - also known as Buk ground-to-air launcher systems. He said Russia had supplied separatist rebels with military hardware, but he had seen no evidence "of the transfer of that type of system from Russia." The weapons that the rebels are known to have do not have the capacity to reach beyond 14,750 feet. The Malaysia Airlines plane was delivered to the company on July 30, 1997, according to Flightglobal's Ascend Online Fleets. It has more than 43,000 hours of flight time and 6,950 takeoffs and landings. Poroshenko said his country's armed forces didn't shoot at any airborne targets. "We do not exclude that this plane was shot down, and we stress that the Armed Forces of Ukraine did not take action against any airborne targets," he said. "We are sure that those who are guilty in this tragedy will be held responsible." The Kremlin said Putin "informed the U.S. president of the report from air traffic controllers that the Malaysian plane had crashed on Ukrainian territory" without giving further details about their call. The White House confirmed the call. Russia's U.N. Ambassador Vitaly Churkin told reporters at U.N. headquarters in New York on Thursday that Russia did not shoot down the Ukrainian fighter jet on Wednesday. "We didn't do it," Churkin said. At least two Russian news outlets reported at the end of June that pro-Russian rebels had seized a Ukrainian airbase in the Donestk region where Buk missile systems were located. It wasn't clear how long the rebels maintained control of the "A-1402 military base," or whether any Buk systems had been removed from it. "It is a busy aviation route and there have been suggestions that a notice was given to aviators telling airlines to avoid that particular area," Shanks said. "But Malaysia Airlines, like a number of other carriers, have been continuing to use it because it is a shorter route, which means less fuel and therefore less money." In Kuala Lumpur, several relatives of those onboard the Malaysian airliner came to the international airport. A distraught Akmar Mohamad Noor, 67, said her older sister was coming to visit the family in Kuala Lumpur for the first time in five years. "She called me just before she boarded the plane and said 'see you soon,'" Akmar said. She said the family saw the news on TV and rushed to the airport to get details. Several other angry relatives were shouting and demanding to see the passenger manifest but there was no official from Malaysian Airline present, and security guards prevented them from going into the airline's operating area. "We have been waiting for four hours. We found out the news from international media. The Facebook is more efficient than MAS. It's so funny, they are a laughing stock," an angry young man told reporters. He declined to give his name.